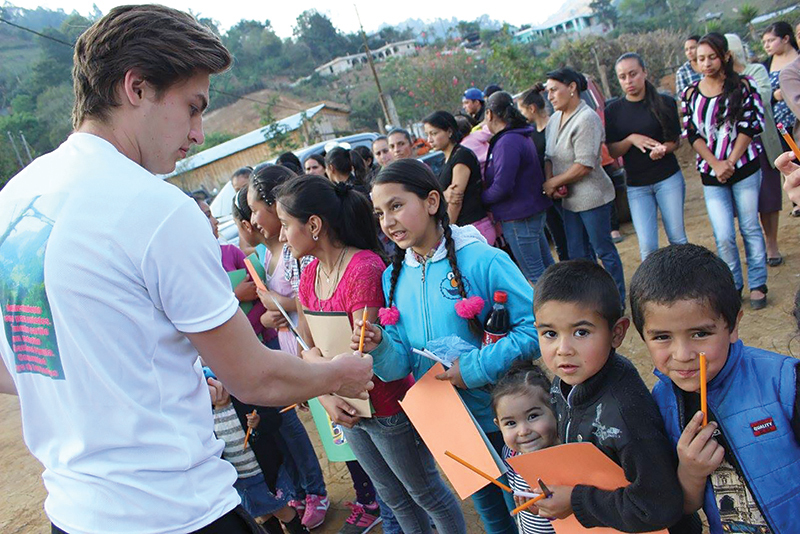 Gabe Smith, a sophomore at Benedictine College, distributes school supplies to the children of Joya de Los Cedros in Guatemala. A group of student missionaries will visit the village for the second time this March to help build a new church, deliver supplies and offer fellowship to the local people. ATCHISON — Tucked away in the mountains of Guatemala, you’ll discover a village with some of the most generous and kind people in the world, said students from Benedictine College here. A team of student missionaries had the opportunity to experience the love of the Joya de Los Cedros village for the first time on a mission trip last March. “We were utterly surprised by the villagers’ excitement and generosity toward us,” said Catherine Kluempers, a senior at Benedictine. “They continued to give and give. Whatever they could do to thank us for our support, they did,” she said. The purpose of the trip was to begin construction of a new church for the Joya de Los Cedros community. The students also delivered building supplies, medicine and school supplies to the locals, all while sharing faith and fellowship. “I went on the initial trip and was captivated by the deep faith and warm hospitality of the local Guatemalans and felt the need to continue this mission in 2017,” said Michael Duchesne, a first-year MBA student who led the trip last year. Maria Hartley, a nursing student with family in Guatemala and connections with Father Marco Mendez, the local priest, started the trip for the first time last March. Last year, the students raised $18,500 for the new church. They raised another $18,500 to build a new church in a nearby village, the construction of which will begin this year. This year, the students have raised $16,000 to cover transportation, food, building supplies, medicine and school supplies for the villagers. But they hope to raise $10,000 to $25,000 more so they can contribute to the construction of the new churches. “I’m so excited to go back and help with the continuation of the chapel,” said Kluempers, who will lead the group of 12 students back to Guatemala. “We will be plastering and painting the walls and continuing to build great friendships with the people,” she said. The continuation of those friendships is what the Benedictine students are most excited about. “[The locals] set aside everything during our stay last March and focused on treating us with great warmth and kindness, as well as sharing their beautiful culture and traditions with us,” said Duchesne. “For all of us,” he continued, “they taught us great lessons of how to welcome others with true and detailed charity, always seeking to make us comfortable and welcome. Organizers encourage anyone interested in learning more about the trip to contact Catherine Kluempers by email at: catherinekluempers@gmail.com.